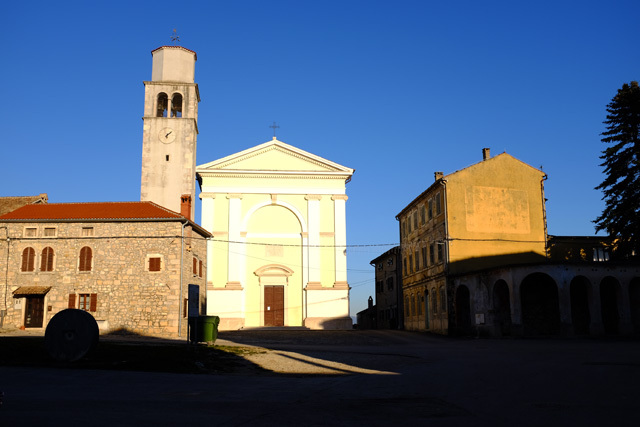 It was a crisp but sunny winter's day with clear blue skies when I set out to walk from Livade to Vižinada. 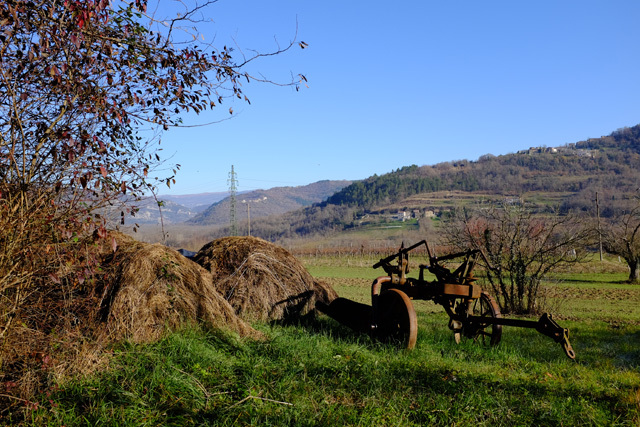 I had cycled the first part of the Parenzana trail from Muggia in Italy through Slovenia to Buje in Croatia, and then walked from Buje to Livade. This would be the third leg of my trip following the entire 123-km-long trail, a former railway line. From Livade the trail follows the main road, heading in a straight line towards the hill town of Motovun and over a short bridge. It then veers to the left where a sign points the direction through the woods. It was cold inside the dense forest, and puddles were frozen over with ice. It was also chilly enough for me to pull out my hat and gloves and put them on. 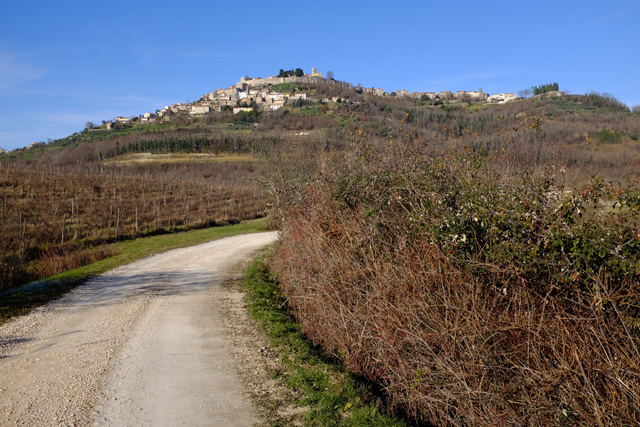 Luckily the forest trail did not last long, and I was soon back out in the winter sun with Motovun looming ahead of me again. It felt quite warm for a mid-December day. 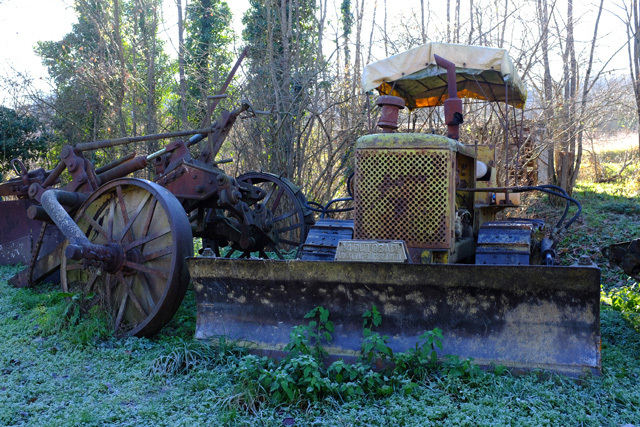 I came across a few fascinating pieces of old abandoned farm machinery on the way. 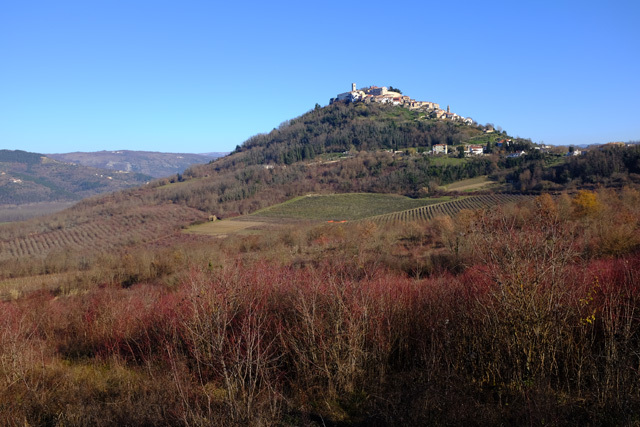 This stretch of the Parenzana trail makes a track around Motovun (which is perched at 277 metres) so I was able to observe this spectacular hill town painted in winter colours under different angles and from different perspectives as I made my way around the base of the village. 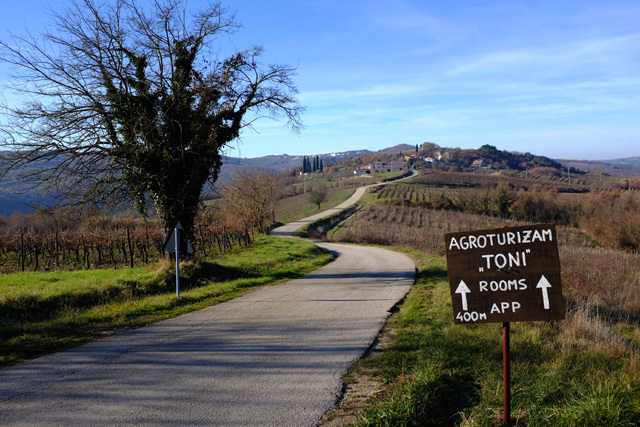 The 222m-long tunnel at Motovun is the longest tunnel on the Croatian section of the Parenzana trail. I spotted a solar panel at its entrance and hoped that meant the tunnel would be lighted. I stepped gingerly inside and turned on my flashlight waiting for the tunnel's lights to turn on. Nothing happened, and of course – Murphy's Law – my flashlight stopped working! The tunnel was pitch black and pretty creepy... I didn't see any light at the end of the tunnel either because the tunnel curves. I was about to turn back... I didn't have the nerves to walk through a pitch black, damp tunnel alone... when miraculously the lights suddenly flickered on! I breathed a sigh of relief and walked as quickly as possible, praying they would not turn off as suddenly as they had come on. I was relieved to finally see the (proverbial?) light at the end of the tunnel and quickened my pace. 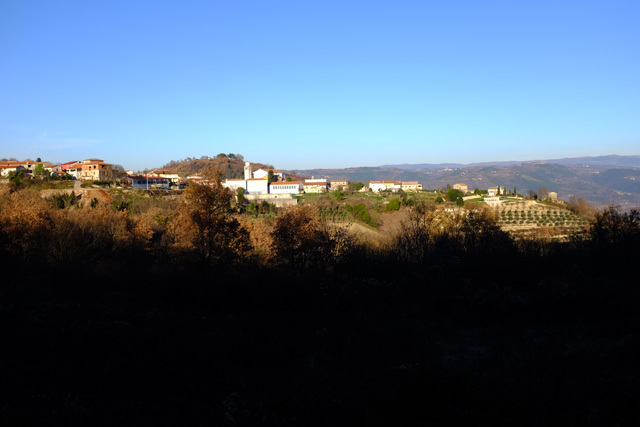 I soon had Motovun behind me and eventually saw Vižinada looming in the distance ahead. There were few people on the trail that day: one or two lone cyclists, and small groups of walkers covering parts of the trail only. This leg of the trail from Livade to Vižinada took me about 3.5 hours to walk. I've now completed three quarters of the 123-km-long trail, and will do the last stretch by bicycle this spring.